2) To contribute to early recovery and reduced impact of the refugee crisis among the refugees and host communities in Imvepi and Palabek Refugee Settlements. Activity 4: NA will also procure textbooks and readers to stock libraries of selected schools with relevant reading materials to improve reading culture and improve grades. Activity 5: NA will also conduct teacher trainings in the selected schools to adopt modern children centered teaching methodologies. Teacher training will include training teachers in making physical learning aids from locally available materials. The teachers will be taken through the practical lessons of making suitable learning aids for the different classes. Activity 7: Guardian awareness meetings focusing on child protection and child education. Including formation of Children Protection Clubs and Guardian Protection Committees. Activity 1: Training of Community Based Facilitators (CBFs) in basic child development, impacts of violence on children, psychosocial and protection needs of children, and developmentally and culturally appropriate normalizing activities for children. The training will also cover the identification of traumatized children or adolescents so that community volunteers are also made aware of the need to refer particularly troubled children or children with special needs to appropriate services. Activity 2: Conducting a participatory assessment with communities to identify both their priorities and their existing community-based resources for addressing the protection and Psychosocial needs of children and adolescents. Activity 3: Selection of community adults and youth leaders that demonstrate an ability and willingness to take the lead in establishing structured activities for Children. These leaders will lead two sessions involving at least 25 children in structured activities including drawing, group discussions, theater and music, sports, recreation and ad-hoc basic educational activities. Activity 4: Implementation of psychosocial activities for children in communities for both girls and boys. Activities that create structure in children's lives may include any number of traditional games, sports, art, and theatre. Children will be encouraged to write or draw in their notebooks, which often elicits stories and the telling of dreams and wishes. 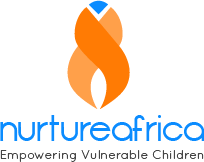 Activity 5: Strengthen Community Awareness and Advocacy for At-Risk Children and Adolescents: Through continuous dialogue and awareness campaigns, the Nurture Africa will promote awareness and participation of community members in care and protection issues. Activity 6: Community Training and Skills Development Opportunities for At-Risk Groups: Through focus groups and dialogue with community committees, at-risk individuals or groups will be identified for participation in an existing, community-based, small skills training or apprenticeship program. Of particular attention will be children heads of households, out of school adolescents, and widowed or otherwise impoverished mothers. Activity 7: Training on case management and follow up of sexual gender based violence cases: Nurture Africa will train a team of local based social workers with counselling skills including trainings in referrals. This is expected to contribute to improved referral pathways initiated by community protection workers, the police or any other responsible implementing partner. Activity 8: Community sensitizations on sexual gender based violence and protection issues: Nurture Africa will use its staff and community leaders to sensitize community on human rights the dangers of sexual gender based violence. Activity 9: Community dialogues on emerging sexual gender based violence issues: In addition to conducting community sensitizations, the project shall hold dialogue meetings with the duty bearers and the rights holders to understand better various underlying causes of sexual gender based violence within the settlement. This shall be done through identification of relevant issues amongst the community members regarding sexual gender based violence and subsequently discussing these issues in the presence of the duty bearers who hold the responsibility to assure the rights of the community members are fulfilled. Activity 10: Conduct Peer Group education on sexual gender based violence: Peer group approach shall be adopted to encourage positive change in Knowledge Behavior and Attitude among the refugee population. The beneficiaries will be grouped based on gender and/or age and will include women, men, youth and the elderly. Subsequently, these groups shall be empowered and equipped to monitor and report sexual gender based violence cases among their peers. Activity 11: Adolescent engagement in life skills training: Life skills such as confidence, decision– making and problem-solving are key factors in the growth process of the youth as it enables one to make informed decisions that will steer him/ her to pursue sustainable income-generating activities and healthy living. Activity 12: Provide community based psychosocial support to survivors. The project staff and trained supporting groups shall carry out the activities following recognized standards and case-specific referral pathways so as to ensure the clients receive the much-needed services, such as counseling, referral and medical attention are supported.